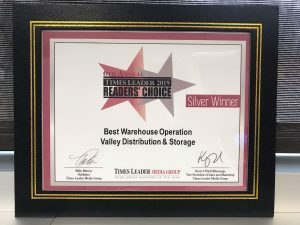 Last week, Valley Distributing & Storage Company was recognized as Best Warehouse Operation at the 6th annual Times Leader Readers’ Choice Awards! The culture at Valley Distributing is defined by its people and its values. We build a high performance culture that brings together talented employees driven to always improve. It is our mission to provide customers with innovative logistics and transportation solution while delighting with exceptional customer service.